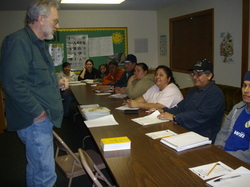 The SEKCC has been offering ESL classes for over six years. The number of classes and level of attendance has ebbed and flowed through the years, but as long as there are a few eager students motivated to learn English, we are committed to helping them make that possible. Our classes are typically offered during two annual semesters, from February to May and from September to December. We are also beginning to offer a new opportunity: computer-based independent study. We have three computers outfitted with "Tell Me More" English language learning software. Please contact us for information on current ESL study opportunities.